The 2018 Code4Lib North meeting will be held at the OCADU Library Learning Zone. We'll begin each day at a suitable time, like 9:30 am. 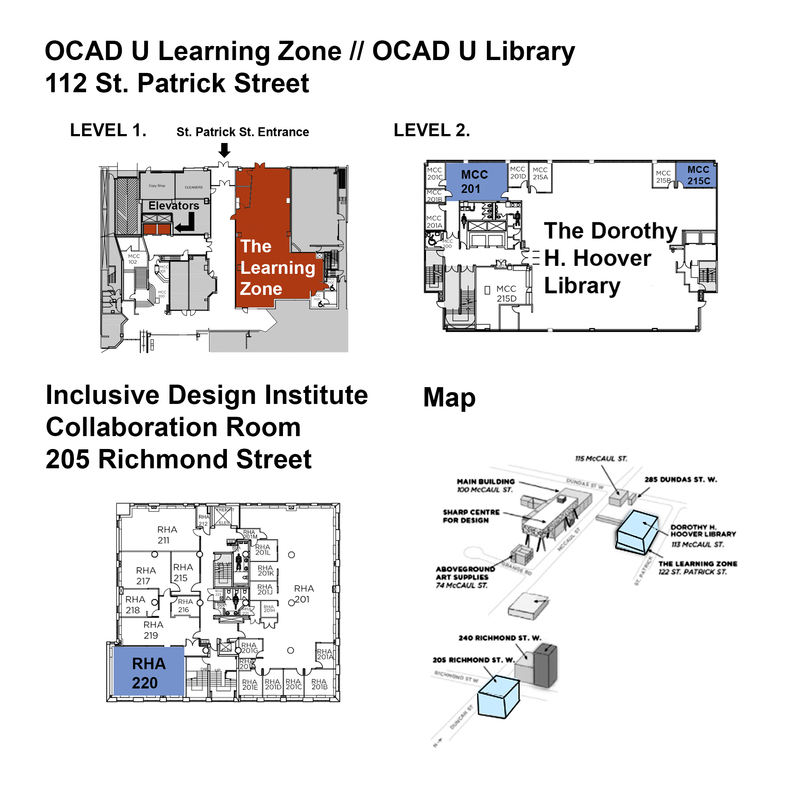 Breakout sessions will take place in the Library on the second floor in rooms MCC 201 and 2015C as well as in the Inclusive Design Institute at 205 Richmond in room RHA 220. 17:30 Social - The Office Pub, 2nd floor, 117 John St.
Giles Orr Cipher Suites for Nginx and HAProxy 15-20 mins. * Just so we can talk to you about getting slides or follow up questions. Feel free to email me instead if you don't want to enter anything here. Depending on feedback we might spend some time running a HackFest/Group Discussions instead of just presentations. Add your ideas. There will likely be a conference social on Thursday night, we're currently working it out. The Toronto Comics Arts Festival (TCAF) is on May 12-13 right after c4l! Coincidence? The organizers have reserved a block of rooms at University of Toronto's Chestnut Residence, which is a 5 minute walk from OCAD. To receive the conference rate, reservations must be made by April 13, 2018. Rooms cost $119/night + HST and include a full buffet breakfast. Reservations can be made by emailing frontdesk.chestnut@utoronto.ca or calling 416-977-0707, Ext 0 and referring to the Code4Lib North to get the discounted rate. Cancellation policy is 48 hours in advance and a credit card number will be required to hold the space. All rooms are private with ensuite washroom, linen and towels are provided. Housekeeping services the rooms weekly. Complimentary wifi is provided. For details, see http://www.chestnut.utoronto.ca/home/summer/. The St. Patrick Street and McCaul Street entrances are both accessible. The 2nd floor Library can be reached via elevator G (located down the hallway from the Learning Zone). There are two single-use gender neutral washrooms in the Learning Zone and one more outside the second floor Library in addition to the two gendered, non-accessible washrooms. A microphone will be available for speakers. If you have any additional accessibility needs or concerns, please contact us. Code4lib North attendees can enjoy a 10% discount when traveling with VIA Rail and Porter Airlines. Use the information below when booking your tickets. Valid: May 8th, 2018 to May 13th, 2018 from all stations throughout the VIA system to Toronto, Ontario and return. Instructions: Please book online or through your travel agent using promo code “C4LIBN”. The discounted fares are available for booking from March 2, 2018 to May 14, 2018. Discount: Porter Airlines is proud to offer a 10% discount on available base fares (with the exception of the lowest class fare during a public seat sale) for travel to and from code4lib North. Porter offers complimentary in-flight snacks and beverages (including beer and wine), Gate Porter service for carry-on and access to the Porter Lounge in Toronto and Ottawa, where free Wi-Fi and comfortable, leather seating is available. Valid: for travel May 7th, 2018 to May 14th, 2018 from anywhere in Canada or US to Toronto and return. Restrictions: The promo code is intended for use by conference attendees and organizers and is not meant for distribution outside of authorized channels. Porter’s fare rules and conditions apply. For any questions regarding Porter’s services or any pre-travel concerns, contact us at 1-888-619-8622. Code4Lib North would like to thank OCAD University for providing space for this meeting, OCADU IT Services for providing wi-fi, and both BiblioCommons and the Ontario Colleges Library Service for providing financial sponsorship.